UK Manufactured Pillows in a wide range of sizes. If you can't find the size you need please contact us for a quoted price. 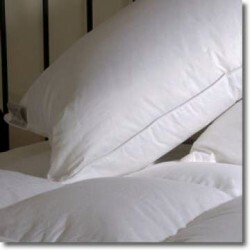 3ft 6in - 90% Goose Down Pillow Ultra soft 90% Natural White Goose Down Clusters with 10% Small..
3ft 6in Pillow in Soft Hollow Fibre Extra Long pillow in luxury Comforel fibre filling.Filling ..
3ft Goose Down Pillow Ultra soft 85% Natural White Goose Down Clusters with 15% Fine Goose Feat..
3ft Pillow in Soft Hollow Fibre Long pillow in luxury Comforel fibre filling.Filling made from ..
75 x 50cm Standard - Goose Down PillowFilled with 85% Natural White Goose Down Clusters and 15% Fine..